San Diego has a strange airport. It’s not strange in the way that Denver’s airport, DIA, is strange, though both are strange airports. For one, DIA is well known as the place where the Infowars New World Order Apocalyptica Apocalypse-o-Rama will start. Others have argued that it’s maybe just the home of the lizardmen and/or aliens and/or mutant stormtroopers. Regardless of the learned debate, DIA definitely has a cursed devil horse. It is also big. It’s unfathomably big: DIA has the United States’ longest civilian runway and the largest land area of any U.S. civilian airport. San Diego’s airport, on the other hand, is the smallest of any airports serving a major American city. It has one very short runway, which also happens to be the busiest runway in the United States, and the third busiest runway out of any in the world. You could throw a rock from the taxiway to the pick up and drop off ring road, unless you’re Chuck Knoblauch. 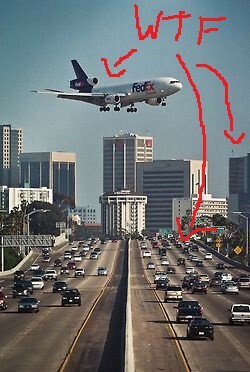 To land at the San Diego International Airport, a plane must be very carefully choreographed into a flight queue and descend in a flight path that goes extremely close to a mountain range. And downtown San Diego. The flight path also goes over Balboa Park and the San Diego Zoo. From a descending plane, you can actually make out individual people walking around the park. The flight path also goes directly over I-5 (“the 5,” if you’re one of the silly natives), which runs about a quarter mile east of the airport. Imagine driving and, all of a sudden, having a 757 about 500 feet above your head. It’s surprising! This terrifying stunt happens regularly. In fact, it happens 20 to 30 times per hour. In 2006, San Diego voters decided not to replace this weird, tiny airport with a new one at Marine Corps Air Station Miramar, which is where the Navy Strike Fighter Tactics Instructor program was based back in the day. You may know that program as Top Gun, probably from the documentary, which was of course A) awesome, B) bitchin’, and C) filmed in San Diego. San Diegans tend to be (objectively) politically and (my vibe) temperamentally conservative. This airport thing is a mix of both: they like the place where it is, and they’d rather not shell out to replace it. Not coincidentally, San Diego is the most military town in the United States; a large portion of SAN’s square footage is taken up by the largest USO lounge anywhere. In San Diego, there are about 100,000 active duty soldiers and sailors living or based in the city, and about 240,000 veterans. Two thirds of the navy’s vessels are homeported there, etc. etc. So when the Marine Corps said they wanted to hold on to Top Gun, I figure people didn’t want to bust their chops about it. I also think that the old flyboys like the excitement, when they come back to town from visiting their high school friends back in Schenectady and Milwaukee. You might not be driving, but in the approach to SAN, you still get to white knuckle that sonuvabitch.